Alex Eddington and Hannah Huff (in the foreground at right) were among the LTU student athletes recognized by the Southfield City Council on Aug. 25 for their work on behalf of the Special Olympics. Student athletes from Lawrence Technological University (LTU) provided assistance at the Southfield polls for the Aug. 5 primary election as part of a coordinated effort that raised almost $6,000 for the Special Olympics. Other student athletes supported youth activities and participated in community beautification in Southfield. More than 30 members of the men’s and women’s soccer teams and the women’s volleyball team participated. 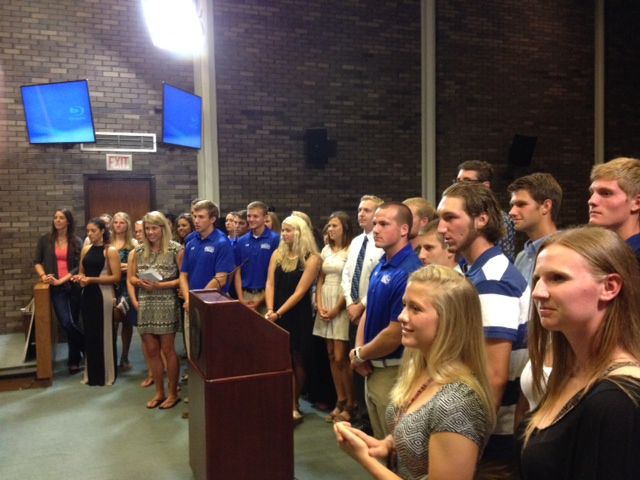 LTU students were recognized for their efforts by the Southfield City Council at an Aug. 25 presentation. As a member of the National Association of Intercollegiate Athletics (NAIA), LTU promotes a lifestyle for its student athletes centered on respect, responsibility, integrity, sportsmanship, and servant leadership. Community involvement is a focal point for the NAIA’s Live Five campaign. Working the polls was a particularly beneficial activity because the LTU students learned about the election process, and many became registered voters. These tech-savvy students quickly picked up on the electronic program used to count votes. “The students complemented the senior staff members that have worked for many years,” Banks explained. Precision is essential in elections, and the number of ballots counted must match the number of voters who participated. “They stepped up to the challenge. They were fearless on the laptops and were easily able to problem solve any computer errors,” Banks said. In her remarks at the Southfield City Council meeting, Banks applauded students as excellent ambassadors for the university and the community. LTU Athletic Director Scott Trudeau believes LTU student athletes continue to set the bar high with their volunteer activities. “I am so proud of our students learning about their civic duty and volunteering to assist others with this process,” Trudeau said. Additionally, some students helped youth activities at Southfield’s Field Zone program, and others performed a community cleanup. “A strong university and a strong community go hand in hand,” LTU Student Engagement Coordinator Phil Lucas added. LTU Dean of Students Kevin Finn believes this will be a continuing partnership for many years to come. “LTU is very proud of the relationship we have with the City of Southfield, and our goal is to continue to seek opportunities to serve our community,” Finn said.